If you have your DNA fingerprint lab results, or your DNA Fingerprint Plus is several years old, order our Premium Upgrade to get a new report. This includes World and European top matches and maps with 18 Marker Ethnic Panel results. That’s our top-of-the-line, state-of-the-science product. Our database now has 500 populations, and there are also new markers. Your Premium Upgrade will be delivered by email with one of our new Specialty Ethnic Certificates. Just specify which of your ancestries you wish to appear on it. If you received a DNA Fingerprint report from us in the last eight years, we have your lab results on file. There is no need to resample or retest. Just tell us the name. 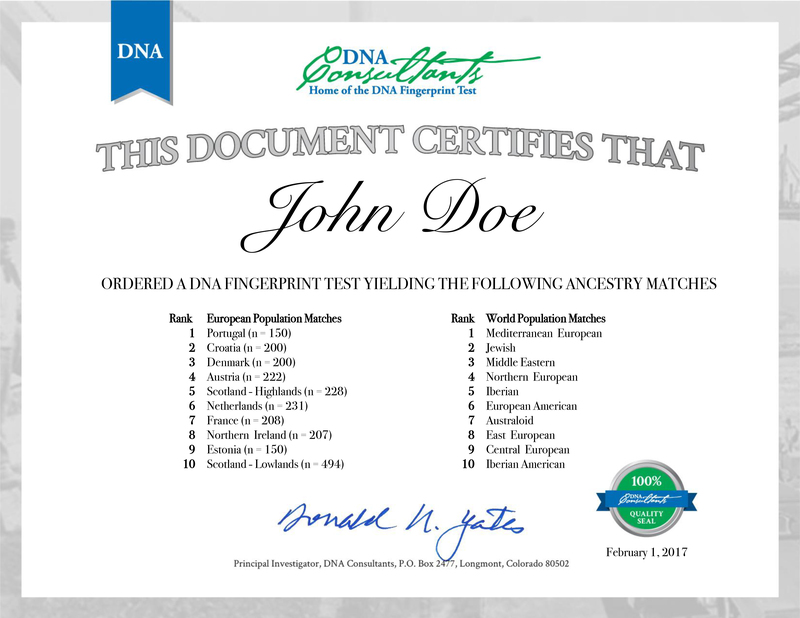 Please specify in your Order Comments what ancestry you desire displayed on your certificate. Hard copies and additional ancestries can be ordered separately for $25.00 each by going to Ancestry Certificate.